Al Reid sent us this report on his first season of Vintage racing. We have added a few photos but didn’t mention anything at all about him winning the Brass Nozzle Award (see the Annual Gala story). Thanks Al and we look forward to seeing you back on the track in 2012. I decided after many years of being a frustrated non-racer that it was high on my bucket list to get some racing in. I had some ideas of what would make sense both monetarily and mechanically. 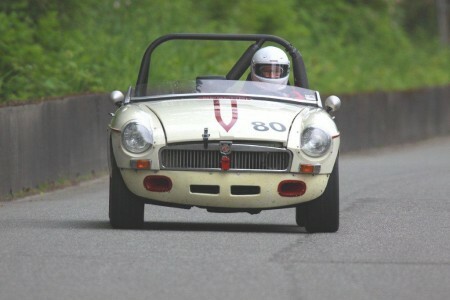 I knew Ralph Zbarsky was involved with vintage racing and was an MG guy. I called Ralph on several occasions and floated some ideas with him. When I told him that I wanted to go “gentleman racing”, he had a good laugh and said that was only true until they threw the green flag. He was most helpful and assisted in making up my mind that buying an already race-prepared car would suit us best. As my chum Pierce Isaacs, who was going to join me in driving the car, is a Washington resident, we decided that a SOVREN-accepted car would make sense. In looking for the best ‘bang for the buck’ and also wanting to have fenders (I think those open wheel guys are a little nuts!) it seemed that an MGB would work well. I located an MGB in Washington that had previously been owned and driven by Joe Gordon. I purchased the car and waited for spring 2011. Ahhh! !, as warned on the VRCBC website, the money started to leave my hands as I found out that I needed new tires (both wet and dry), full driver safety gear (from head to toe) and current dated seat belts. 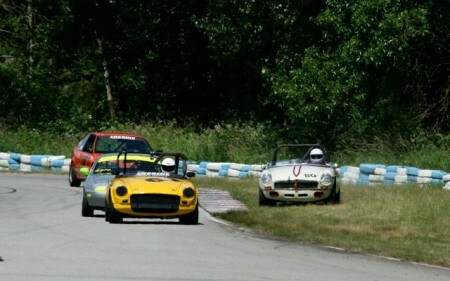 I joined the Vintage Racing Club of British Columbia and started attending their meetings. Everyone interested in Vintage racing should join this club and get to know the members. They are good guys and have an amazing wealth of knowledge about all things racing. I applied for the Sports Car Club of BC’s Race Driver Training program for March and completed my medical. I waited impatiently for driver training and then finally I did the tech, classroom and two day on-track sessions. I managed to complete the required three Saturday novice races without any misbehavior and earned my senior Vintage race license. I then went racing on the Sundays with the VRCBC members and had a ball. Along the way I ‘mowed a little grass’ (not too much though) but most importantly, I didn’t hit anything. Each outing was a personal best and I had some terrific racing with other members. I was unable to drive in the last race of the year, so I asked Stanton Guy to drive the car. Was this a good idea or a bad one? His lap times showed me up a little and somehow the gearshift lever left the transmission. Anyway, we fixed it with some help and then Stan had a great time and I was very happy to see the car in the field. What made the year very special for me was having a group of my friends come out to the races, help with the car and just generally hang around. We have been travelling to Vintage races for years and now we can enjoy them ‘from the inside’. Thanks Pierce, Doug, Jock, Peter, Ken, Rod and Steve. 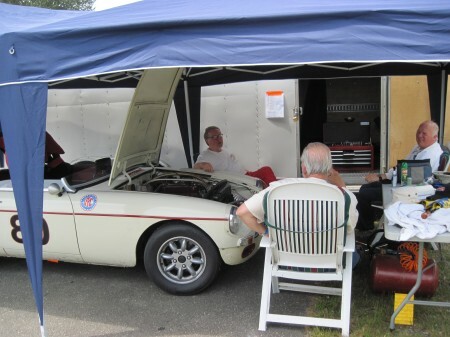 I am really looking forward to next year and having Pierce co-drive the MGB with me. And now for the most important part of this ‘annual report’. The VRCBC has about 125 members from all over BC, plus some in other parts of Canada and the US. As I stated previously, the Club membership has a wealth of knowledge, resources (and parts!) to share with the Vintage racing community. For anyone wanting to get into racing there are a number of excellent cars for sale, ready to go as well. Check the excellent and informative web site. Remember ‘Vintage’ doesn’t mean old guys (and gals), its means old cars. Race Driver Training – I can’t say enough about the Stecs and the Race Drivers Committee (the RDC)-the organizers-for the tremendous number of very knowledgeable instructors who attended and herded us novice rookies through the proper procedures of racing and track etiquette. And a personal thank you to Vic Nightscales for all of his help and patience with me. Track Operations – A lot of people spend a lot of hours giving us racers a place to play. It is VERY much appreciated. All those who can attend work parties should do so; it is for our benefit and there is always a variety of tasks that need to be done. I saved this comment for last as it was the part of my first year experience that impressed me most, not that I wasn’t impressed with everything and everybody. As part of race driver training we were asked to spend a day on the track with the turn workers. Wow, these folks are knowledgeable, trained and conscientious about keeping us safe and orderly on the track. I was so impressed that I went back and spent another day with them later in the year. Thanks to all the men and women who travel all over to do this most important job. Well that’s year one, I can’t wait for year two. Thanks and Seasons Greetings to all.